Planning a party? 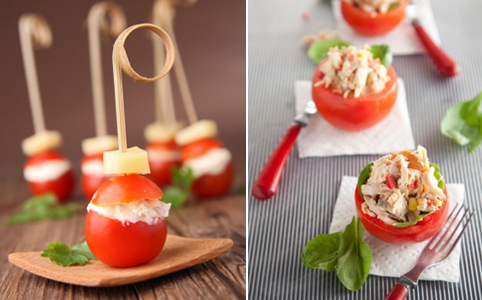 We've collected 5 of our favorite appetizer ideas just for you! Each one is easy and fast - not to mention delicious! These recipes are all intended to be served as individually sized portions that can be hand held and carried around the room as your party guests mingle. Just set out some personalized cocktail napkins and your guests can grab their food on the go, with plates being optional. To keep guests moving, you can set up your appetizers and signature drinks at different stations around the room. This is a fairly traditional appetizer, but what makes it new and fun is the presentation of the dip and chips in individual containers. Plastic tumblers make the perfect dipping cups and can even be personalized to match your party theme. The adorable chip bags shown here are made from parchment paper. Simply fold and fill! The tutorial can be found here, courtesy of DIY Louisville. 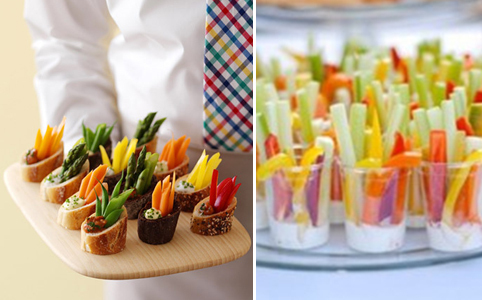 Everyone loves fresh vegetables and dip at a party. Again, like the chips and dip it is a typical party food that can be jazzed up by serving the veggie sticks in shots of dip. 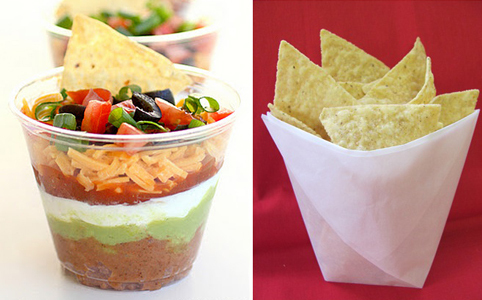 This serving method also prevents the dreaded double dip. You can also get creative with the vegetables you offer. Try pea pods and sliced peppers along with your standard carrots, celery, and cucumbers. You can also take a cue from Martha Stewart and offer your veggies and dip in little hollowed out baguettes like the crudités shown here. 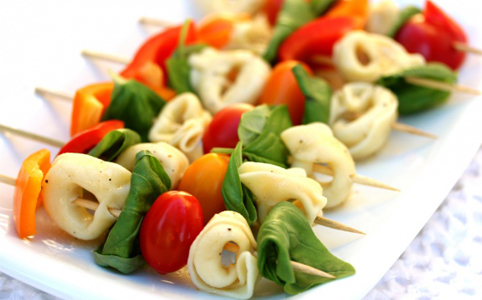 Serve your pasta salad on a stick to enhance the individual flavors of the salad. Large cooked noodles, like the tortellini shown here, are the perfect bite size. Add cherry or grape tomatoes and chopped peppers to complete the skewers. Be sure to mix everything in your favorite seasoning before assembling the skewers to get the full flavor of a pasta salad. These delightfully cool and crunchy appetizers are simple to make and always a crowd pleaser. Begin by slicing baguettes and toasting them in the oven on a shallow cookie sheet. 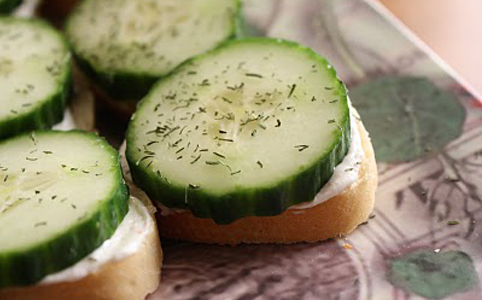 Mix cream cheese and ranch dressing mix to spread over the toasted bread and top with a slice of cucumber. This treat is like eating the best parts of a salad in one delicious bite. Serving your favorite chicken salad recipe in a hollowed out tomato is a healthy option that you can whip up quickly and easily. Served cold, these chicken salad stuffed tomatoes are refreshing on a hot day, making them perfect for picnics. They can be made with either medium sized tomatoes or cherry tomatoes for bite sized treats. If you are careful to make your chicken salad with low-fat ingredients, these appetizers can have a gourmet appeal that is also waistline friendly. This dish is the perfect contribution to your next work potluck or church luncheon. For other articles, tips, and ideas, sign up for our monthly email updates.